February was an extremely active and successful month at Bendicion de Dios! We thought we’d share some of the highlights with you! We thought we'd share a note from Julio, the Director of Bendicion de Dios, on both the emotional and practical impact of the Volcan de Fuego eruption. The devastation wrought by the eruption and pyroclastic flow from Fuego Volcano on June 3 was tragic. We are gratified by your incredible generosity. In just eight days, we raised over $3,500. Eruption of Volcan de Fuego, the "Volcano of Fire"
You may have heard that the Volcan de Fuego, less than a mile from Bendicion de Dios, erupted on Sunday, June 3, spewing lava, ash, and burning debris on to the surrounding towns. This pyroclastic flow can travel as quickly as 50 miles an hour and destroys everything in its path. You may have heard the devastating news that at least 72 are dead, thousands are injured, and hundreds are homeless. The death toll is expected to rise. The impact on the whole community is severe. Fortunately, none of our students or their families was directly harmed. However some homes in Alotenango were destroyed and several nearby towns were completed inundated by the resulting mud flows, the lush coffee farms on the slope of the volcano have been wiped out, and families are desperately searching for loved ones. Today thousands of Guatemalans are suffering from the impact of this volcanic eruption. Thousands more across Guatemala are helping out, including Julio who is organizing desperately needed supplies (water, food, and home rebuilding) for relief efforts in the devastated village of Porvenir, a town just 10 minutes from Alotenango. Villagers escaping from el rodeo, a village totally destroyed by Fuego. Under the Same Moon would like to help Julio help the victims of this disaster. Whatever support you can provide would be much appreciated! As the world notes with sorrow the 50th anniversary of the assassination of Martin Luther King, probably very few people outside of Guatemala noticed the death at 91 of King's human opposite, Efrain Rios Montt, organizer of the genocide against the Ixil Maya during the 1980s. This genocide was part of a thirty year civil war that ended with a truce agreement in 1996. As always multiple projects are underway at Bendicion de Dios. The most dramatic and exciting is the new vocational classrooms under construction: a large kitchen, a sewing room, and a workshop for metalworking and repairs. After welcoming words from a new school administrator and a new English-speaking teacher, we were entertained in dance and song. How creative can our children get with some crayons, construction paper, and glue sticks? I know we often take for granted our access to these simple tools. In Alotenango, Guatemala, the children and their teachers cherish these supplies. They are carefully guarded and treated as the precious resources they are there. Through your generous help, we have been able to share this experience with the kids at Bendicion de Dios. Our merry band of travellers is excitedly prepping for our upcoming visit to the school. I’m not going to lie; made merrier by the horrid winter conditions here. It’s a balmy 78 degrees in Antigua, Guatemala today. Mother Nature willing, we depart next Tuesday, January 16. A few kindhearted folks have offered to send supplies to us for the children at Bendicion de Dios and suggested we post a “wish list.” We’re, of course, thrilled to do so. Our wish list includes items that are needed and are lightweight enough to be carried in an extra suitcase or two. Do you have any extra school supplies we can provide to kids in Guatemala? If you’re local, would you like us to pick up any supplies you can donate? Would you be able to mail them to us before January 16? This year we hope to blog post excerpts and photos during our trip. We’ll post them on UTSM’s website (www.underthesamemoon.org) and at our Facebook page (https://www.facebook.com/UTSMGuatemala/). Follow along if you'd like!! 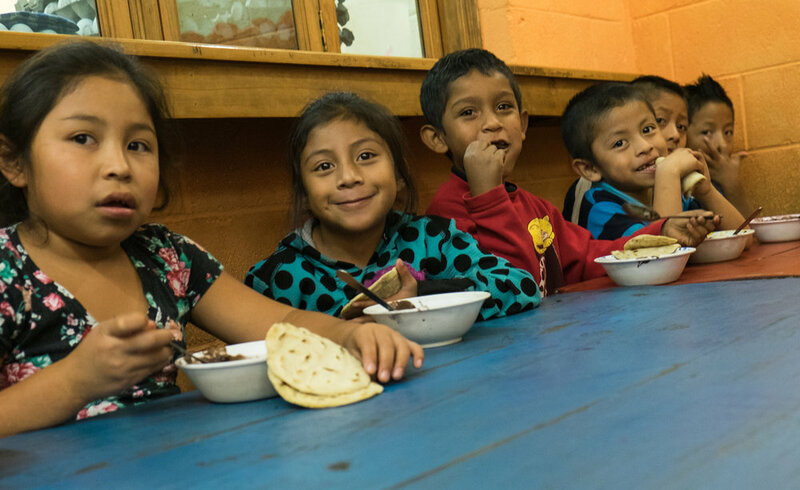 The end of 2017 is fast approaching and we’re looking back at the impact we’ve made on the families at Bendicion de Dios in Alotenango. None of our work could be done without our amazing supporters! The data tell a powerful story. UTSM is reaching more children, creating more opportunities and developing deeper friendships with folks like you. Last year with your support, the school Bendición de Dios started a 7th/8th grade program for children who completed the sixth grade. This expansion created an environment for advanced learning and opened up a world of different opportunities for these children. Also thanks to you and others, Julio Garcia Gonzalez, the director of Bendición de Dios, was able to purchase land and build a small trade school around the corner from the main building to teach sewing, cooking, carpentry and mechanics. As well, the primary grade students still enjoy healthy snacks and a world-class literacy experience with constant guidance from US bilingual educators. Moreover, last year UTSM received donations via its website for the first time, obtained matching funds from the Gates Foundation on #GivingTuesday, and saw the modest smile.amazon.com matching funds nearly double from the previous year. And based upon your generosity, we continued to expand our student sponsorships, doubled our donations for family stoves, provided more funds for teacher scholarships, and continued our regular financial backing for the school and other special projects. As we look to 2018, we ask you to join us in celebrating these successes—made possible through your kind and generous support—and to join us in our continuing effort to build our network of interested folks and finding more ways to contribute.